In can only exist with government subsidies which means an entire industry is dependant on getting money from the government for their existence. That is never a healthy thing. Favoritism is the kindest word to describe what this inevitably leads to. Need I say “Solyndra”? A company that does not need to make a profit in its own right is not a healthy thing either. If you have to make a profit, in a free-market society you have to produce a product or service that has value beyond its price or no one will buy it. When no profit is required, that discipline is missing. Your continued existence is dependent on your relationship with the federal government, not on the efficacy of your product. There is no need to add value to society. 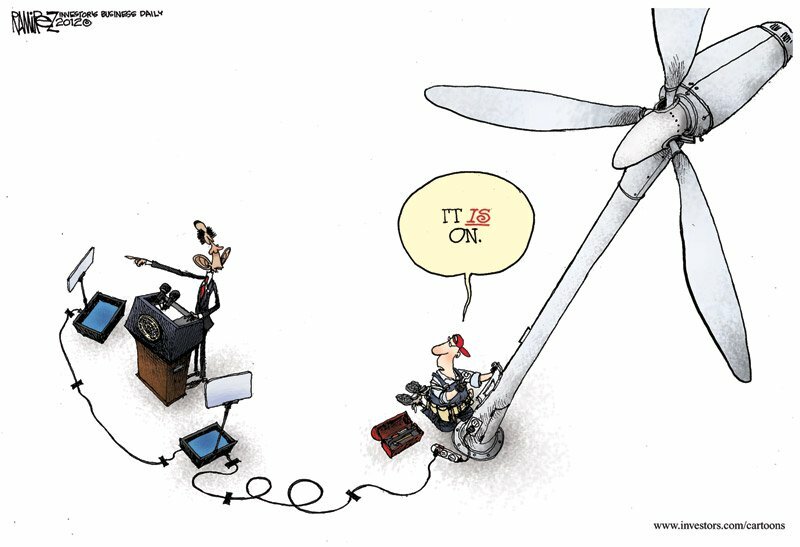 This entry was posted in Cartoons, Energy, Opinion and tagged alternative energy, green energy, Solyndra, teleprompter, wind power. Bookmark the permalink. Spot on.That is why they(government) can’t make money with the post office,dmv,toll booths to name a few.